Hawaii Native Status: Introduced. This naturalized ornamental plant is native to South America, primarily Brazil. Flower Color: White, but the flowers are so tiny that from a distance, they visually blend in with the green parts of the inflorescence and appear light greenish yellow. Description: The flowers are tiny and have 5 petals and 5 sepals. 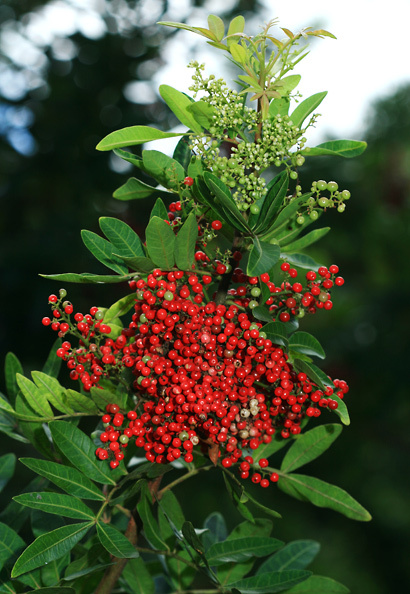 The flowers are followed by showy masses of small, round, pink to red, one-seeded fruits. 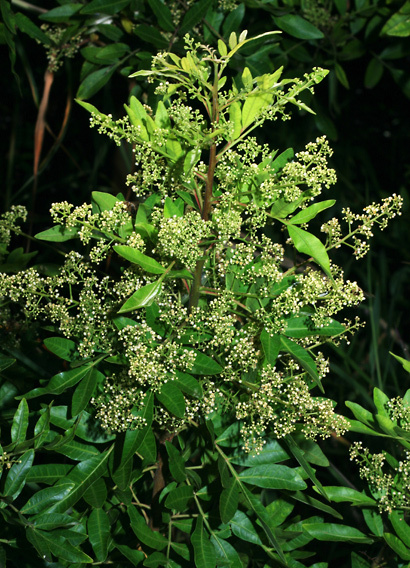 The leaves are hairless, dark green in color with lighter green veins, and pinnately compound with 5-11 (typically 7), oblong to elliptic leaflets. 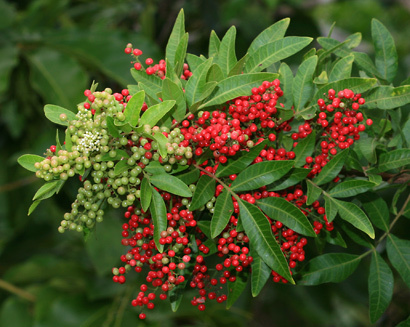 Here in Hawaii, Brazilian Peppertree is an invasive weed in both mesic and wet sunny lowland areas where it crowds out native plants and releases allelopathic substances that inhibit their growth. Birds eat the fruits and are responsible for spreading the seeds. Foul-smelling – The crushed leaves have a strong, peppery, resinous smell very much like black pepper mixed with turpentine.